This was on my heart to share with you today. These are some of the Scriptures I speak over myself, and pray over others. I recorded it today in the studio, and added the beautiful music of our friend, Darren Scroggins. The Scriptures are written for you below, so you can say it along with me. Declare the Truth of God's Word for yourself and your family! I want to call this “Your 5-Minute Miracle,” because I believe you can receive your miracle from the Lord as you speak aloud and meditate on these words from God's Holy Word with me. Please Comment Below and let me know if this has been helpful to you. 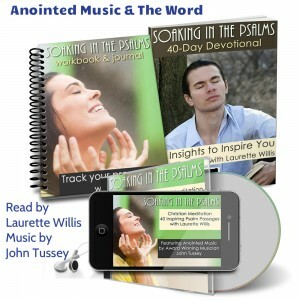 Instant Download: “Soaking in the Psalms” 3-piece Christian Meditation program, with the anointed music of award-winning John Tussey and Psalm portions read by Laurette Willis (comes with eWorkbook and 40-day devotional). 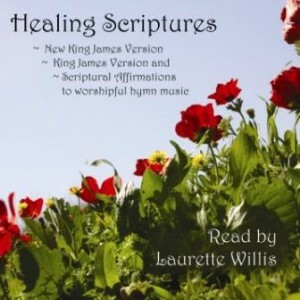 Healing Scriptures CD – Healing scriptures read by Laurette Willis to beautiful hymns played in a contemporary style. LORD GOD, YOUR WORD SAYS that You, Lord Jesus, bore my sins in Your body on the tree & You took my infirmities and bore my sicknesses (Isaiah 53:4-5; I Peter 2:24; Matthew 8:17; John 6:63 & Luke 5:17b). 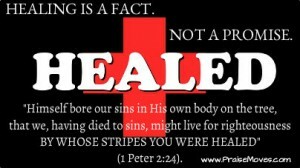 Therefore I am dead to sin, and alive unto God and by Your stripes I am healed and made whole. I refuse to allow sickness to dominate my body. The life of God, Your life, flows within me bringing healing to every fiber of my being. 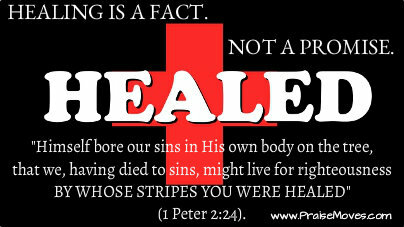 I am dead to sin and alive unto God and by Your stripes I am healed and made whole. The life of I Peter 2:24 is engrafted into every fiber of my being (it says “Himself bore my sins…) and is a reality in my body restoring and regenerating every cell – making me alive with the life of God (Rom 6:11 & II Cor 5:21). YOUR WORD SAYS in John 10:10 that You, LORD, have given me abundant life. I receive that (excessive, overflowing, surplus, over & above, more than enough, more than sufficient life) through Your Word and the power of the blood of Jesus. John 6:63 says that You have imparted Your life to me. Therefore, Your life restores my body with every breath I breathe, every word I speak, and every move I make. Your life flows to every organ of my body bringing healing and health. Your word is life to me. (Mark 11:23,24) – I pray this believing without any doubt in my heart. According to James 1:21, I receive Your implanted word in me which has become a part of me. It flows to every cell of my body, restoring, transforming, and regenerating my body. Psalm 107:20 tells me that You sent Your word and healed me. I receive my healing now according to Your word. Body, line up with God's word! YOUR WORD SAYS in James 4:7 – “Submit to God, resist the devil and he will flee from you.” Therefore, I resist the enemy in every form that he comes against me. I require my body to be strong and healthy, and I enforce it with the Word, the “sword of the Spirit.” I reject the curse, and I enforce life in this body. According to Proverbs 4:20 – 22 Heavenly Father, I attend to Your Word. I incline my ears to Your sayings, I will not let them depart from my eyes. I keep them in the midst of my heart, for they are life and healing to all my flesh. According to Psalms 91: 10-11 NO evil will befall me, neither shall any plague come near my dwelling. For You have given Your angels charge over me. They keep me in all my ways. In my pathway is life, healing, and health (Prov 12:28). My body is the temple of the Holy Spirit of God (1 Corinthians 6:19), and nothing of the enemy can reside in the temple of the Most High God! I present my body a living sacrifice to You, and I will not be conformed to this world, but I am being transformed by renewing my mind to the Word of the living God (Romans 12:1-2). Believe you receive when you pray in line with God's promises to you, and you absolutely WILL HAVE (Mark 11:24)! HAS THIS HELPED YOU? I'd love to know! Please leave a COMMENT below. Thank you so much. 20 Responses to "His Words are Life"
Saying the Healing Scriptures aloud throughout each day is an amazing source of strength, empowerment and I’m certain, ultimate healing for me! May God continue to enlighten, empower, encourage and provide mightily for you, dear sister! Yes, healing is a fact. We are healed from the curse of eternal damnation due to Christ’s stripes which is what I Peter tells us. When we rightly divide God’s Word, and even use common sense, we know that all sicknesses will not be healed–no matter our faith. Job and Paul had enormous faith–faith that proved true through many trials, tribulations and “thorns in the flesh”. If all sicknesses were healed, our bodies would never die. Thank you for your thoughts and prayers. May God continue to mightily enlighten and empower us all, remembering that teachers will be held in strict accountability for what they teach. Soli Deo Gloria! REPLY FROM LAURETTE: Hello, dear Stacy! I have studied extensively on this subject, so I completely understand your points, and the age-old traditions surrounding them. Many would be uncomfortable reading this, but those who love the Lord, as I know you do, are hungry for the truth, even if it goes against our traditions. By God’s grace we have scriptures for each one of these points, so I thank you for bringing them up. I’ll address each one, and later I’ll make a little video or audio so people can follow along in their Bibles (I’m using the New King James, but I also use the KJV). — and the rest of this passage shows that He was wounded for us – and by the stripes (the “blows that cut in”), we are healed. b. New spirit, not healed spirit: At salvation, we are given a new spirit (“a new creation” 2 Cor. 5:17). We are given a new spirit (a “new heart” the Lord calls it: “I will put a new spirit within them, and take the stony heart out of their flesh” Ezekiel 11:19). That’s why “spiritual healing” is a misnomer. We can be healed in our soul (mind, will and emotions) as well as our body, but only God through the Lord Jesus Christ can give us a new spirit — with the Holy Spirit of God Himself on the inside of our recreated human spirit. c. This is translated more clearly in Matthew’s gospel after Jesus rebuked the fever from Peter’s mother-in-law, healing her physical body: “…that it might be fulfilled which was spoken by Isaiah the prophet, saying: ‘He Himself took our infirmities and bore our sicknesses’” (Matthew 8:17). b. Yes, much of God’s ways run counter to our common sense, and while I certainly don’t understand all of His ways (“For as the heavens are higher than the earth, So are My ways higher than your ways, And My thoughts than your thoughts” Isaiah 55:9), it’s a blessing to study His Word and seek to be more like Him “Therefore be imitators of God as dear children” (Ephesians 5:1). c. Point: “we know that all sickness will not be healed” – I’m reminded of Jesus in His own hometown: “Now He could do no mighty work there, except that He laid His hands on a few sick people and healed them. 6 And He marveled because of their unbelief.”  and here was the “CURE”  “Then He went about the villages in a circuit, teaching” (Mark 6:5-6). If God wants everyone to be saved, why are not all saved? Not all receive. 	The sin nature in man was paid for and destroyed in Jesus’ sacrifice on the cross for us, placing His precious Blood on the Mercy Seat as an atonement “once and for all” (“with His own blood He entered the Most Holy Place once for all, having obtained eternal redemption” – Hebrews 9:12)  (“the wages of sin is death” Romans 6:23 – Jesus paid the price for us – and “the life of the flesh is in the blood” Leviticus 17:11 – He paid with His own Blood) – but we must receive it in order to have it (John 3:3; 7; Romans 10:9-10). 	God will not force us to receive from Him, or be with Him for all eternity. He leaves the choice up to us. “Therefore, choose life,” He says (“I call heaven and earth as witnesses today against you, that I have set before you life and death, blessing and cursing; therefore choose life, that both you and your descendants may live” Deuteronomy 30:19). 	If God wants everyone to be healed, why are not all healed? Not all receive. Even in Jesus’ own hometown. And He marveled…then He went about…teaching.” He came teaching, preaching, healing – in that order. People have to know it is God’s will to heal them, else how will they know to believe Him to be healed? It’s not based on merit or being a good person. Many good, saintly people do not receive their healing. They think it may be their “cross to bear” or “thorn in the flesh,” which I’ll cover in the next point. 	Job’s experiences warrant a lengthy study, and I have been blessed to do so, trying to understand. There are several resources which I may point those interested (simply contact me, and I would be happy to do so – Rev. Keith Moore has some wonderful teaching resources on his website http://www.MooreLife.org, many of them at no cost). 	One short-form response touches on the possibility that fear opened the door to the work of the enemy in Job’s life. We know that fear is of the enemy (“God has not given us a spirit of fear, but of love, and of power and of a sound mind” 2 Timothy 1:7 – when I learned that fear is a spirit, and not a mere emotion, I realized that we have power to rebuke it and command it to leave. Love is a spirit more powerful than fear – “God is love” 1 John 4:8; and “perfect love casts out fear” 1 John 4:18). 	Paul’s “thorn in the flesh” – this has been a point of strong tradition for many. I’ll just share 2 scriptures which highlight that it was not sickness, nor a gift from God to “make him humble,” but it was sent from the enemy “a messenger of Satan,” as Paul says. 	Paul writes, “And lest I should be exalted above measure by the abundance of the revelations, a thorn in the flesh was given to me, a messenger of Satan to buffet me, lest I be exalted above measure” (2 Corinthians 12:7). 	Throughout the Bible, whenever “thorns” in the flesh, eyes, sides, are mentioned, thorns pertain to people, not physical ailments (Numbers 33:55; Joshua 23:13; Judges 2:3). It was a common saying of the day. Paul was being tormented by these “messengers of Satan” operating through people. Some call them Judaizers, who insisted that all Gentile Christians must become proselyte Jews before being allowed to fellowship as Christians. 	When God said “My grace is sufficient for you,” He meant that His grace (God’s willingness to use His power and ability on our behalf) was sufficient and more than enough for Paul to overcome in this situation. When we are “weak” in ourselves (“infirmity” means weakness, not “sickness,” as we think of it today); when we are humble and not puffed up with pride, God’s grace is sufficient and much, much more than enough for us. “God resists the proud, but gives grace to the humble” (James 4:6; 1 Peter 5:5). Many believe this, yet there are numerous instances in the Bible and throughout history where people came to the end of their lives at a healthy, ripe-old-age and just fell asleep in the Lord. “With long life will I satisfy him and show him My salvation” the Lord said in Psalm 91:16. So – we don’t have to leave until we’re “satisfied” and have done all the Lord has called us to do. Of course, there are martyrs, such as Paul and the thousands through the generations. Their blood cries out: “When He opened the fifth seal, I saw under the altar the souls of those who had been slain for the word of God and for the testimony which they held. 10 And they cried with a loud voice, saying, “‘How long, O Lord, holy and true, until You judge and avenge our blood on those who dwell on the earth?’” (Revelation 6:9-10). “Moses was one hundred and twenty years old when he died. His eyes were not dim nor his natural vigor diminished” (Deuteronomy 34:7). Joshua, Elizabeth, Abraham, Sarah, Caleb…numerous accounts of longevity and finishing strong. And there are documented cases in history (even recent history). Gloria Copeland has a good book, “Live Long, Finish Strong,” that lists many biblical, historical and contemporary accounts of people living long, fruitful, vigorous lives—who then just stepped over into eternity when their course was finished, leaving their physical bodies without the ravages of disease. Both my parents died long before their time, so I know the heartache of losing loved ones from disease, suicide, accidents, even murder. It is not God’s will. We will not find any place in Scripture where the Lord said, “It is not My will to heal you.” In fact, His first redemptive name given to the people of Israel is Jehovah Rapha, “I Am the Lord who Heals You” (Exodus 15:26). Absolutely, Stacy! I agree that it is vital we continue to study God’s Word, pray, ask for His blessed guidance and revelation and not go our own way, or the way of traditions of men, no matter how revered, or long-standing. James said: “My brethren, let not many of you become teachers, knowing that we shall receive a stricter judgment” (James 3:1). James went on to add: “For we all stumble in many things. If anyone does not stumble in word, he is a perfect man, able also to bridle the whole body” – and then he shared how we can bridle the whole body, which is another fascinating teaching, but it flows in perfectly with our subject today, too. “No man can tame the tongue” (James 3:8) – so we are thrilled that the Holy Spirit can! How? 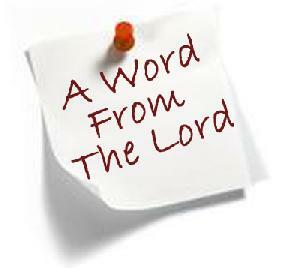 I believe by speaking the Word of God – speaking in agreement with God’s words, thoughts, and will. This builds our faith (“faith comes by hearing, and hearing by the word of God” Romans 10:17), and makes us more sensitive to the *still, small voice* of the Holy Spirit. Jesus said, “My sheep hear My voice, and I know them, and they follow Me” (John 10:27). Some traditions are absolutely wonderful, beautiful, inspiring, and rooted in Truth. Others are not. We might believe certain ways because of personal EXPERIENCES, or because someone we look up to told us it was so. It then becomes a discipline not to allow our experiences or opinions to trump the Word of God. If we do not do so, we are the ones who lose—and the word of God actually becomes ineffective in our lives. Jesus mentioned this to His disciples, saying that they had made “the commandment of God of no effect by your tradition” (Matthew 15:6). That may be because “faith begins where the will of God is known,” and if we do not know or accept the word of God in a certain area because of how we’ve been taught, we will not be able to have faith to receive it. As Jesus said in several places, “Your faith has made you whole” (Matthew 9:22; 15:28; Mark 5:34; 10:52; Luke 8:48; 17:19). It’s so good to know the will of God in every area of life so we may have faith to receive everything He has for us to be all He is calling us to be. Again, thank you so much Stacy, for giving us an opportunity to delve more deeply into what we believe and why. “Soli Deo Gloria” – Yes! To God alone be all the glory, all the honor, and all the praise! Hallelujah for His great mercy with which He loves us. This is beautiful!!! It reveals God’s healing power and how he promises to take care of us. It is really relaxing for me to hear scripture set to music. Can you make more of these in different topics? I would be so grateful. You have a gift in recording scripture to music. The way you recite the scripture through His Holy Spirit is so affirming. Thank you. Ill listen to this everyday. I have downloaded it to my computer. Thank you and may God bless you. What a blessing for you to record this. Such a beautiful voice you have. I know it say it Psalms 107:20, He sent his word and healed us and delivered us. Thank you! The WORD is working mightily in me! This was great hearing you proclaim the word and reading it at the same time — even more powerful and then hearing, reading and speaking the word of God over ourselves….POWERFUL! Thank you again! Abundant Blessings to you Laurette and PraiseMoves! Laurette, Your sweet spirit is aligned with our Holy Father to teach us to speak life…Thank you for sharing your beautiful gift with us…. Beautiful Laurette! I love listening to you speak God’s word over me!! “The Healing Scriptures and Music” will definitely be a part of my daily meditation. God’s Word combined with mellow music enhances the truth of His Word in my heart and mind. In addition, I feel as if I’m experiencing heaven on earth. I will use this to speak over my dad. I was using the healing scripture cd for some time but fell out the routine. This has given me a renewed commitment, to start speaking God’s powerful Word and Promises over him again. I am still and will continue to pray for a miracle for my dad because I know My God is able. That was AWESOME. May God turn his countenance toward us and give us all peace. thank you so much for these affirming scriptures–im currently reading them from Kabul, Afghanistan, at 3.27am, and i’m richly blessed! I’m also going to send them to my sisters who need physical and spiritual healing. What i love the most is how you take the time to respond to comments, expounding the Word, biblically centered, weaving various scriptures together to emphasize the”spirit/intent” behind the message. So, in actual fact, you are teaching! It is so important to not blindly follow, one should know what they believe and why. thanks so much and remain forever blessed, in His Name! Dear Norah – Thank you so much for your kind words. Isn’t it amazing that we can connect all the way from Afghanistan to Oklahoma and all around the world?! Your area of the world is one where we would love to be able to offer PraiseMoves classes. If you or someone you know is interested, please let us know. May God richly bless and empower you. I know you are doing a great work for the King of kings! Thank you for the precious healing scriptures which bring health and healing to our bodies. So beautiful you are a blessing. Thank you so much for taking the time to pour out our Lord’s cleansing and healing words on our heads and into our day. Thank you so much for this word. I always have such a connection with the Lord as I set before Him under our ministry. God is doing a great thing in my life and I am seeking Him about Praise Moves and becoming an instructor. Thank you so much for this!! My body needs a healing and I will stand on these scriptures and confess and agree that my body is healed!!! !